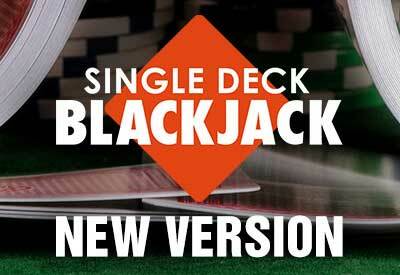 Of all the Blackjack variations, Single Deck is the most sought-after, as it gives you the best chance to win. Certainly, anyone using card counting techniques will benefit, but even those using a basic Blackjack strategy will improve their chances of winning. Single Deck Blackjack (sometimes called Blackjack Pro) is played with a single deck of cards, rather than the more common 6 or 8 decks. In ‘standard’ Blackjack, the house edge (in other words, the casino’s advantage) is around 0.6% (i.e. the casino expects to keep 0.6% of all money staked). This is the lowest house edge of any casino game. 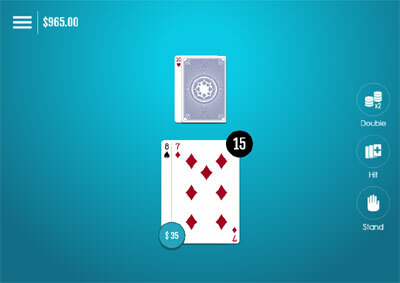 In Single Deck, the house edge is just 0.15%, which means it’s as close to a 50/50 coin as you’ll find in the casino! As we explain on our Blackjack variations page, casinos often try to bring the balance back in their favour by only paying 6:5 on a Blackjack, rather than 3:2. Although this isn’t a huge difference in terms of payout, it puts the house edge back up to 1.45%. Fortunately, Bovada are above such underhand tricks, and payout at 3:2 in their Single Deck. The game itself follows Bovada’s recent design brief in making the games clean, modern and minimal in design. All the game play buttons are visible, but in an uncluttered, unobtrusive layout, making game play quick, easy and efficient. Table limits are $0.25 – $300, and all standard rules apply – the dealer must hit on soft 17, you can Hit, Stand, Split, and Double, and the payout is 1:1 for everything except blackjack, which pays out at 3:2, and insurance (which we don’t recommend taking! ), which pays you 2:1 if the Dealer is dealt a natural 21. If you’re new to the game, Bovada gives you an easy introduction – they offer an interactive basic game play tutorial under the “Learn More” tab on the menu, which takes you step by step through a round of Blackjack, and offer you $1,000 play money chips to practice on their free play game. When you feel confident to sign up, they’ll give you a bonus package of up to $3,000 – $1,000 on each of your first three deposits. Basic wagering (read here for an explanation of wagering) is just 25x, but please note that although Single Deck is eligible, it only counts 5%, so the actual wagering / playthrough is 500x. For that reason, we’d recommend mainly playing Slots until the wagering is complete. But a few hands of Single Deck won’t hurt in the meantime! Click here for full details of Bovada’s bonus package, and for more information on the casino, read our detailed Bovada casino review. Full list of available Blackjack bonuses for new players!